Feeding the kids after school snacks have been a bit of a challenge, especially for my boys. I have to take some of the blame for this, well maybe all of it, but it does feel therapeutic to pass the blame a bit. When they were younger I showered them with love through my cooking asking, “would you like some of this or some of that?” Hard to turn back the clock, plus they are teenagers now. I have already declared that I will feed the baby without a word, let’s see how that goes. They do not want leftovers and want a meal, not a snack. Always complaining that everything at our home has to be made, I try to keep frozen and processed foods to a minimum, to this I say, “some day you will thank me.” So today my oldest son decided that he wanted something with salsa. Since his favorite one is a recipe that my brother’s wife Eda makes I thought it was a perfect time to share this. Eda is from Sinaloa, Mexico and she makes killer salsa. 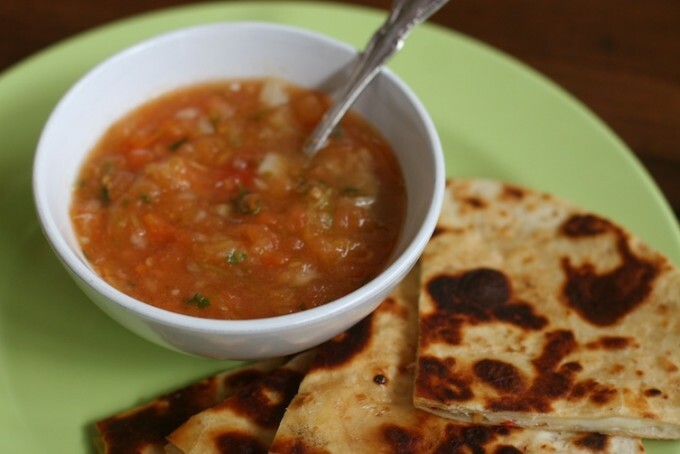 Once you try this and see how easy it is to make this salsa you will never want the jar kind again.I decided to make a simple cheese quesadilla with these tasty “Chili and Onion Tortillas” from Trader Joe’s. I also made some baked tortilla chips with the last tortillas by cutting them into chip shapes, spraying them with a bit of oil and baking them until they were light brown and crispy. Then I asked, “Do you want some guacamole with that?” What can I say; it’s a hard habit to break. I love that idea but once again, didn’t have any, so you decide which you would like to try. or little as you like to control the heat. I added some onion for a nice crunch. In a saucepan add the cored tomatoes, serrano chilies and water to cover about an inch above the tomatoes. On high heat bring to a boil, then reduce the heat to a simmer and cook for about 3-5 minutes or until the skin of the tomato starts to curl and the chilies turn a dark green. Set aside in the cooking water and let cool. 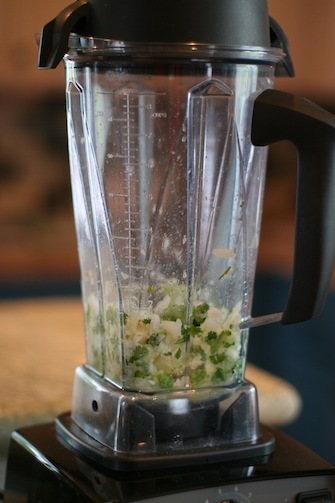 In a blender or food processor add the chopped onion, garlic cloves, cilantro, seasoning and lime juice, and pulse a few times until the ingredients start to crush up. 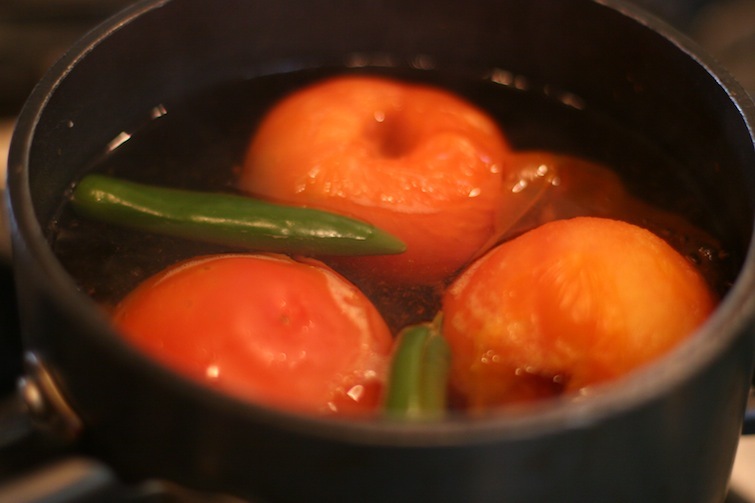 Now add your cooled tomatoes, chilies, half of a cup of the cooking liquid and continue pulsing until the mixture is nice and chunky. Keep covered in the refrigerator for up to three days. This salsa goes great with all types of dishes or just a nice big bowl of chips.